Bill Shedd has traveled the world advocating for sport fishing and the oceans. 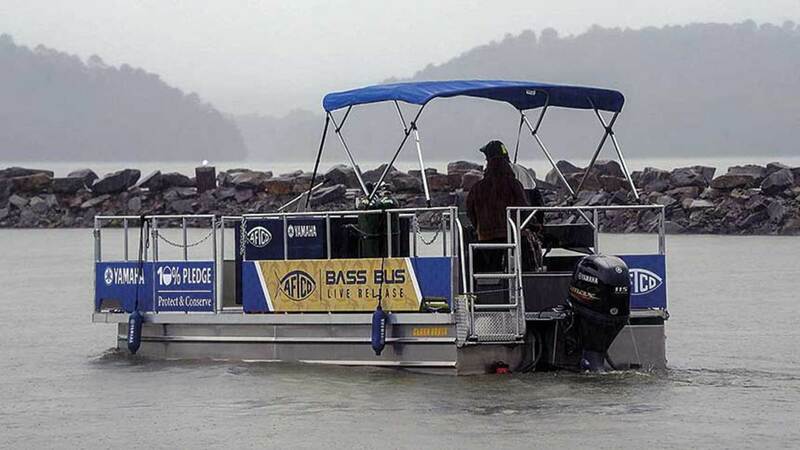 The AFTCO Bass Bus was developed to help keep fish caught during a tournament healthy. Since late 2018, sportfishing advocate Bill Shedd has been having a particularly good run. In August, the president of the American Fishing Tackle Co. helped get California’s legislature to eliminate drift gillnets, a type of swordfishing gear that has been criticized for capturing and killing unintended species of fish and mammals, called bycatch. In early March, Shedd participated in an industry fly-in to Washington, D.C., to support a federal ban on the drift gillnets he’d worked to ban in California waters. AFTCO helped develop alternative deep-set buoy gear that will help commercial fishermen catch swordfish without bycatch. His father, Milt, an investment banker and fishing enthusiast, started the Mission Bay Research Foundation in 1963. A year later, Milt co-founded SeaWorld with a fraternity brother. The foundation was renamed the Hubbs-SeaWorld Research Institute. Milt served as chairman of the board at SeaWorld until he retired in 1985, with Bill growing up at his knee in the business. In 1973, Bill’s parents bought AFTCO from the widow of the company founder, and to this day, the company donates 10 percent of proceeds to conservation. Bill joined the company as sales manager in 1974 and watched as his father harvested swordfish by harpoon to collect specimens, facilitated research projects, took family and friends fishing, tagged pelagic fish, created a sea bass hatchery program and worked to enact the first ban of gillnets south of California’s Point Conception. In 1988, while Bill was fishing out of Manasquan Inlet in New Jersey, he saw the number of boats in the Northeast tuna fishery; he created the Tag a Tuna for Tomorrow tournament. It led to the AFTCO Tag/Flag tournament that has become one of the world’s most successful tagging recognition programs. Like his father, Bill’s career has always included being a leader in the saltwater fishing world. 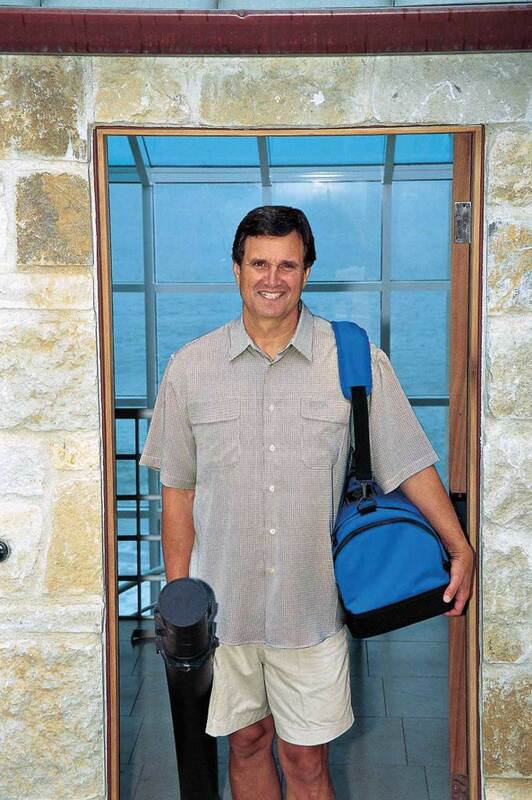 After he became AFTCO president in 1994, he was elected to the Hubbs-SeaWorld Research Institute board of directors. In 2007, he was named chairman of the board. In 2017, Shedd was presented with the American Sportfishing Association’s Lifetime Achievement Award for his advocacy efforts, which also have included serving on the boards of the California Artificial Reef Enhancement Program, International Game Fish Association, Coastal Conservation Association of California, and International Game Fish Association’s Center for Sportfish Policy. Since 1999, Shedd has been friends with artist and conservationist Guy Harvey, and in 2004, AFTCO became the licensee for all Guy Harvey sportswear. The partnership helps to raise awareness of the need for conservation of fisheries and the environment. In 2010, the two men teamed with AFTCO’s retail partners to raise $500,000 to study possible implications from the Deepwater Horizon oil spill in the Gulf of Mexico. Continuing the family tradition at AFTCO, Shedd’s three children work at the company. Cody, 39, is vice president of finance and general manager; Christie, 34, is operations manager; and 30-year-old Casey is vice president of sales and marketing. Bill’s wife, Jill, works in payroll. Until recently, the Shedd family’s advocacy focused on saltwater angling. In 2018, AFTCO started to work on the freshwater market, primarily bass fishing. 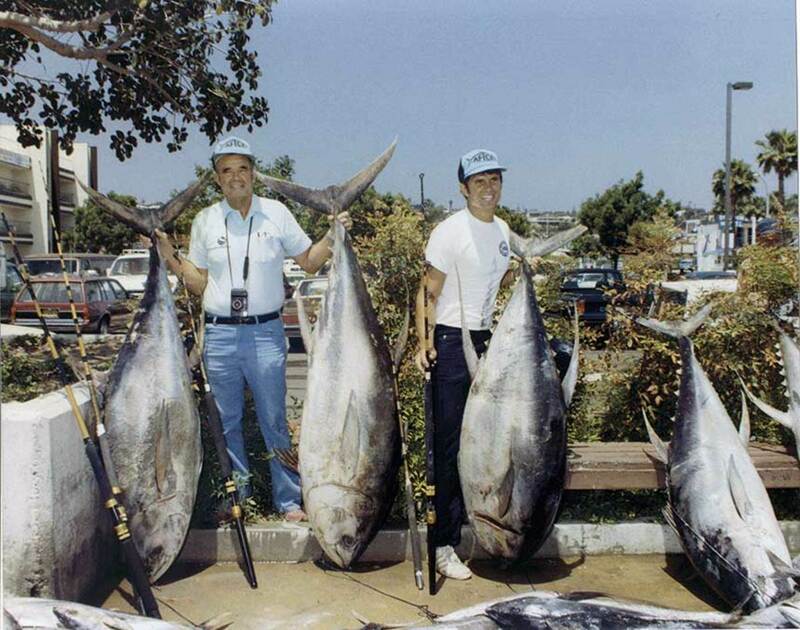 Milt (left) and Bill with tuna they caught during one of their many outings. “We’re taking some of the same game plan from the saltwater world and applying that to the freshwater world,” Bill says. First, AFTCO looked at handling and release techniques. The company produced a brochure called Fish Care 101 that explains how to handle caught fish to reduce mortality rates. AFTCO also worked with the fishing group BASS to make conservation grants available. 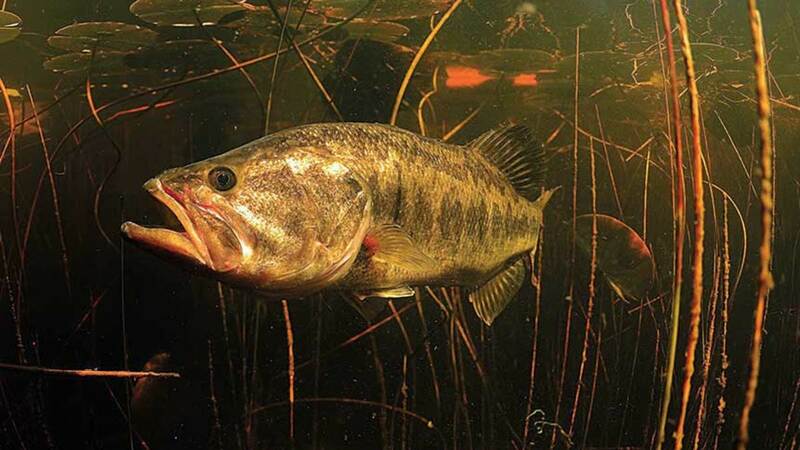 A local group in Virginia received a $5,000 grant to restore lake grass, and a local effort in Tennessee received $5,000 to build a bass habitat. AFTCO also partnered with FishUSA to support the GLATOS research group in the Great Lakes with a $10,000 donation. To help bass caught during tournaments go back to their environment, AFTCO built the Bass Bus. The company partnered with Yamaha for the live-release pontoon boat, which has a climate-controlled live well. Instead of fish being released back into the harbor where the weigh-in is taking place, they are placed in the well on the Bass Bus and taken back out into the lake to be released in their environment. In 2018, AFTCO began advocating for freshwater fish, such as bass. Shedd estimates that he has spent 10,000 hours on advocating for fisheries and the oceans. As proud as he is of his family’s efforts, he is equally encouraged by the increased participation of the overall fishing industry.